Twenty years ago, mailbox theft wasn’t a huge problem in the world and those who lived in the country worried about very little when it came to identity theft. Thus, country mailboxes of the past varied greatly. In some areas, the postal service was very lenient as to what could be considered a viable mailbox, as well. Often, if you drove through the rural areas of your state, you’d see mailboxes made from Crisco cans, wooden planks or other unused materials. Many times the mailbox wouldn’t even have a proper door or signal flag attached. The rural mail carriers simply drove through the area, inserting mail into whatever type of makeshift box they found at the side of the road. However, today the USPS requires much more of country mailbox users. In addition, due to the rise in vandalism and theft, it’s important country mailboxes are much more secure and appropriately fitting to the current situation in America. 1. A Locking Mechanism: Even though the majority of identity theft mail crimes occur in residential or urban areas, a rural setting offers a great opportunity for mail thieves to steal mail without anyone seeing them. Since rural mailboxes often sit very far from the residence and there are few to no neighbors in the surrounding areas who could witness them taking mail from a rural mailbox, the scene is set perfectly for a mail thief to succeed. Thus, it’s extremely important for country mailboxes to have locking mechanisms on them. 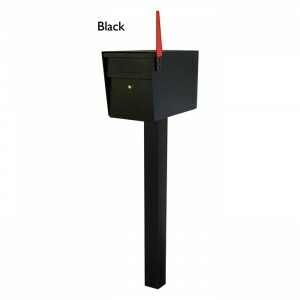 Residential locking mailboxes are common today, in all areas, due to the rise in identity theft. They can help keep your mail and all private or personal information safe, until you can retrieve it from your box. 2. High Quality Construction: While vandalism is often not able to be prevented and most mailboxes can’t fend off paint or explosives, a country mailbox should be made of durable materials. Most preferably, country mailboxes can be surrounded by brick encasements. This can help if your mailbox is often damaged due to local teenagers who think using a baseball bat on a mailbox is a fun activity. In addition, it can help prevent cars from running off the road and hitting your mailbox. 3. USPS Regulation Sized Parts: Although the USPS gives their customers a lot of freedom when it comes to the design and type of mailbox they can install at their home, there are many rules they expect residents to follow these days. The size of mailboxes is one thing they do focus on, as well as the placement. Almost all country mailboxes are roadside mailboxes, as they are often spread very far apart from one another. Often, the mail delivery person drives their own personal vehicle, as well. Mailboxes should be positioned on the side of the road in a way where the carrier doesn’t have to leave their vehicle. This requires the box to be about 41” to 45” off the ground, and about 6” to 8” from the curb.